Take back your outdoor space with the opulent Galtech 9' Wood Quad Pulley Rotational Tilt Patio Umbrella. This patio umbrella is sure to endure from season to season with its marine grade varnish that is applied in 6 layers to seal the wood. With its wide selection of colorful Sunbrella and Suncrylic fabrics this patio umbrella is sure to coordinate beautifully with any decor. A lavish design and easy to use, this quaint umbrella is perfect for your outdoor environment. 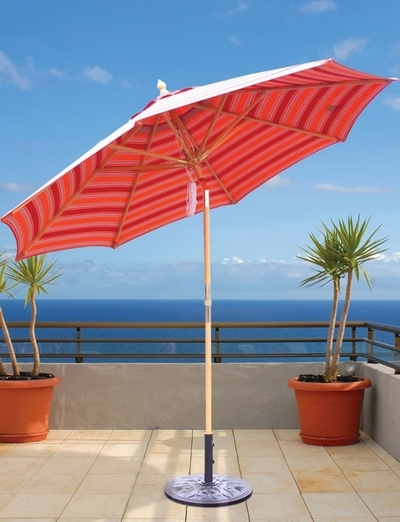 This umbrella offers vibrant outdoor fabrics in luxurious colors and patterns. Add some upscale style to your outdoor space this season with this stylish Galtech 9' wood patio umbrella.